Discussion in 'Mixing and Mastering' started by Banz, Jan 21, 2019. With this technique you will know how exactly a plugin / hardware does in your signal. Have you stopped to think that sometimes a plugin adds a 'color' that changes the equalization of your track and sounds great or bad but you do not know exactly what? For example a hipass of Neve 1073 or just the fact of putting a tape simulator your track already becomes more soft and midrage... does not need much more to sounds good. Or even a Waves CLA plugin that just inserts into the channel drastically changes the sound. With this plugin, you can see virtually what each equalizer does to your signal and so you end up understanding how they act and is a great tool to learn and see curves of eq's and their variations of models. It's a plugin that copy the frequency curves of any signal that passes through it, unfortunately does not copy saturation, but in it we can get a base of which plugin / equipment does with your signal (if it is equalization thing). I'll post some photos of known plugins that you know have coloring, but do not know exactly what happens (and how interesting this is for your learning). Isn't that so cool? The possibility to understand the curves that each plugin does to a track (even if it does not simulate saturation), you can really understand how everything is working, great tool to learn. I hope you can take advantage of this tool that is not widely spoken but for me it is one of the most valuable tools! If someone know how to upload jpg photos to show in the post, please, help me! Haha! I do copy/paste, but you typically have to reduce the dimensions to something like 800x600 or 1024x768. Can't remember which. i use this site for jpg sharing. 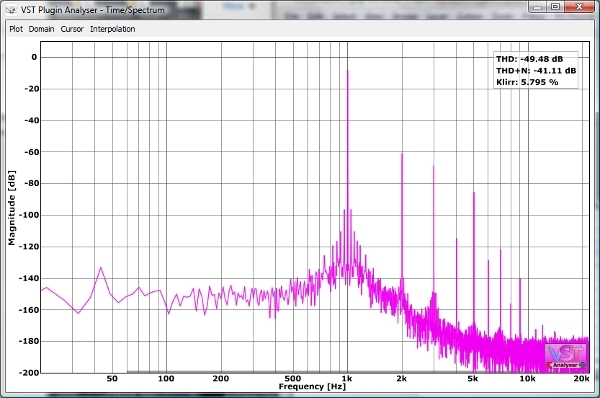 These pics only show the amplitude frequency response, which is about 20% of the story. What you see might look fun but it doesn't say much about what a plugin does to sound. Well, I don't think so, 20%? If you compare A/B I really garantee you in 80% of the cases, you'll not be able to judge the difference between them. But if you don't agree, its all good! I'm sharing this because I really see this as a tool that can open your eyes when talking about equalization and how they set some start points. IMHO better save those $49 and run a spectrum on a generated white noise file processed through a plugin of choice if you need just the frequency domain. I'm no expert on this, but pretty sure one could write simple JSFX for Reaper that'd do the same thing and more. Indeed EQ is the most obvious influence on sound, well, at least if there are no drastic phase or transient or linearity changes. But you know, if this was the whole story, then you could emulate every plugin sound just by EQ'ing and that's definitely not the case. I know that, but it's better to stack up on free and quality plugins. Makes it easier to go legit, better than to relearn the workflow later. This is exactly what he does here and reveals that Acoustica audio is just selling you digital stuff! Thanks for comment, I will search more informations about that for sure! You're welcome, this plugin is pure fun! but be careful, it can make you spend all night watching phases and curves. I say this from experience. I use Christian Budde's VST Analyzer. Too much watching, not much listening. That's bad. Learn how to listen. Watching is much easier. The thing is that some of us like me for example don't have access to highest quality studios + speakers so that they can hear the difference between a -50db hardware simulation process and the unprocessed signal. I work with headphones for example, not bad headphones but still headphones, because i have no access to neither speakers nor studio. Things like plugin doctor help me to know what i have to pay attention to when i A/B the things. P.S. : also i find it someway fun to go and see what my plugins are doing, call me crazy (maybe i am a bit), but i am mad at phase shifting and all that stuff, very scary for meee. And you can't see what phase shifting is in any other way than graphically. P.P.S. : aaalso i think that a double check both visually and audibly is the best thing since most of the times there are things ears can't hear, and that could cause you problems later. For example how would you hear a 5 Hz bleeding that needs to be high-passed?